Cuvelier studied with the two principal painters of the northern French city of Arras, Constant Dutilleux and Xavier Dourlens; he learned photography, however, from his father. Adalbert Cuvelier was a successful oil merchant who retired and devoted the rest of his life to photography. For him, photography was an art, not a trade, and the photographer's "aesthetic sensibility and knowledge must be embodied in his works just as those of a painter are expressed in his paintings. "2 Adalbert's few surviving photographs exhibit a technical skill and aesthetic qualities that not only won him the esteem of his fellow painters but also laid the foundation for Eugène's photographic work. Carrefour de l'Epine dates to the early 1860s, during one of Eugène's many summer visits to Barbizon (he had first visited in 1856 with Dutilleux).3 Like other Barbizon painters, Cuvelier sought to capture the experience of the forest as a place of solitary contemplation, rather than depicting points of interest. Although by this time guidebooks and footpaths had made the forest accessible to tourists, Cuvelier sought out secluded passages such as this scene, which reveals the hidden beauty of the grove of trees that seems to emerge from a lavender mist. Cuvelier lavished great care on his prints in order to achieve a tonal and textural richness. He frequently used paper negatives and the salted paper process rather than popular collodion negatives and commercially prepared albumen paper. Paper negatives were made of fine writing paper sensitized with silver salts, exposed in a camera, developed, and fixed. The process yielded images with a matte surface and a soft, atmospheric quality resulting from the texture of the paper negative—characteristics that were ideally suited for creating romantic landscapes. After Corot's death, 200 photographs described as different subjects, "after nature, by various artists,"6 were found in his studio. Whether or not some of these photographs were made by Eugène or Adalbert Cuvelier is not known. 1. Letter from Millet to Rousseau, December 31, 1861, quoted in Aaron Scharf, Art and Photography (Baltimore, 1974), 92. 2. Letter from Adalbert Cuvelier to Charles Chevalier, quoted in "Publications photographiques," La Lumière (August 12, 1854), 128. 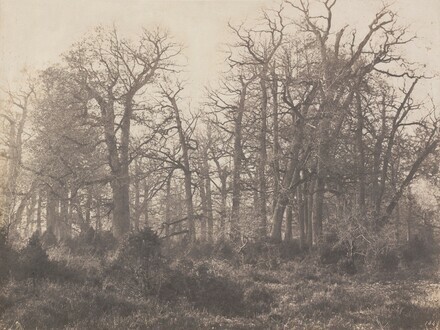 Reprinted in Malcolm Daniel, Eugène Cuvelier, Photographer in the Circle of Corot [exh. cat., The Metropolitan Museum of Art] (New York, 1996), 7. 3. Eugène Cuvelier's marriage in 1859 to Louise Ganne, the daughter of a Barbizon innkeeper, was a major social event for the community of painters; Corot acted as witness. 4. Clichés-verre are made either by coating a glass plate with printer's ink or photographic emulsion and scratching this coating with an etching needle, or by painting the ink directly onto the glass plate, which is placed on sensitized paper and exposed to light. For more information, see Elizabeth Glassman and Marilyn F. Symmes, Cliché-verre: Hand-Drawn, Light-Printed, A Survey of the Medium from 1839 to the Present [exh. cat., The Detroit Institute of Arts] (Detroit, 1980), 29. 5. For a discussion of the influence of photography on painting see Scharf 1974, 89–92. 6. Alfred Robaut, L'Oeuvre de Corot: Catalogue raisonné et illustré, vol. 4 (Paris, 1905), 264. Reprinted in New York 1996, 14. Possibly the estate of Eugène Cuvelier; by inheritance to the descendants of Louis Ganne Cuvelier's sister Victoire; David and Mary Robinson, Sausalito, CA; NGA purchase, 1995. 19th Century Photographs from the Collection of Mary and David Robinson, Achenbach Foundation for Graphic Arts, California Palace of the Legion of Honor, San Francisco, 1986. In the Forest of Fontainebleau: Painters and Photographers from Corot to Monet, National Gallery of Art, Washington; The Museum of Fine Arts, Houston, Houston, 2008, no. 90. Da Corot a Monet. La sinfonia della natura., Complesso del Vittoriano, Rome, 2010, unnumbered catalogue.